^ Stanley M. Walas (1988). Chemical Process Equipment:Selection and Design. Butterworth-Heinemann. ISBN 0-409-90131-8. ^ Gas Processing Suppliers Association (GPSA) (1987). Engineering Data Book (10th Edition, Vol. 1 ed.). Gas Processing Suppliers Association, Tulsa, Oklahoma. ^ Vic Marshall; Steve Ruhemann (2001). Fundamentals of Process Safety. IChemE. p. 46. ^ Harry Kooijman and Ross Taylor (2000). The ChemSep Book (PDF) (2nd ed.). ISBN 3-8311-1068-9. See page 186. 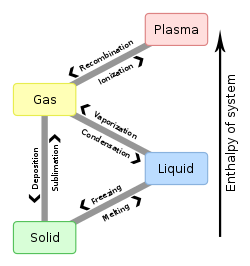 ^ Curtis H. Whitson, Michael L. Michelsen, The Negative Flash, Fluid Phase Equilibria, 53 (1989) 51–71. ^ Richard A. Lovett; Nature magazine (March 18, 2013). "Earthquakes Make Gold Veins in an Instant: Pressure changes cause the precious metal to deposit each time the crust moves, a new study finds. The insight suggests that remote sensing could be used to find new deposits in rocks where fault jogs are common". Scientific American. Retrieved March 18, 2013. This page was last edited on 13 June 2018, at 12:09 (UTC).